The 2014 Super Bowl capped off a terrific season of football and The Final Drive had all the news and notes. But before I move on to the post where I look back on what were surely awful pre-season predictions, we should take another gander at that big game and a few of my final musings. It’s time for some Mostly Average Analysis. -I just want to make sure everyone comprehends my take from Sunday night: I’m not absolving Peyton Manning of blame for this horrendous performance. He’s just as responsible for this loss as the defense that couldn’t stop the Seahawks from making big plays even though we all knew their offensive is predicated around making big plays. Or the special teams squad that gang-rushed Percy Harvin on the kickoff bounce, allowing him to burn past through their unplugged gaps. Or maybe the o-line that couldn’t give him any longer than 2.5 seconds in the pocket. Or the receivers that failed to find separation or make a freaking move once they actually caught the damn ball. Demaryius Thomas was the only Bronco receiver that looked even remotely ready for that level pf physicality (and now we’re finding out he separated his shoulder in the first quarter). And ya know, if would have been nice if anyone could have heard anything Manning was saying on that first play. 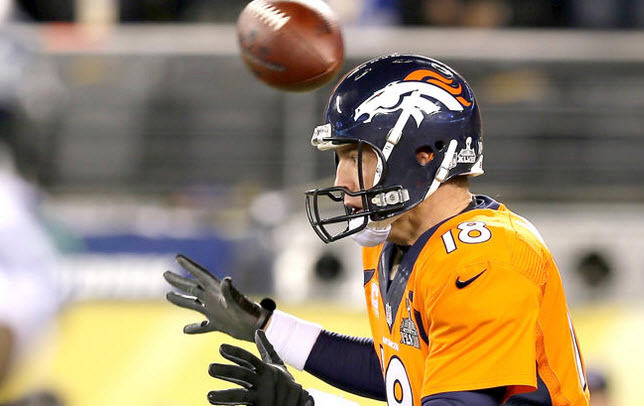 But Manning clearly is at fault for some of the low-lights. But NFL clubs win as a team and lose as a team, and it took the entire Bronco organization working together to lose that badly. -It’s probably just me, but I find blow-outs just as entertaining as close games. I mean, I’d rather have that as opposed to some 10-6 defensive struggle where kickers take center stage. We’ve been spoiled as hell the past few Super Bowls with match-ups that were tightly contested going into the fourth quarter. But before that? We had a series of “uninteresting” games that didn’t have sustained competition. Frankly, we were due a stinker. -With the game’s rampant “success” in Jersey (which means they missed the hella-storm that came afterwards by about ten hours), reports surfaced that more cold weather cities were getting into the bidding for the 2019 games. Chicago, Boston, and Washington were among the new entrants. Jesus. Like the traffic in Boston wouldn’t be a complete clusterf*ck. And Washington? The outside of that stadium is a mud pit. Chicago’s a likely candidate with its infrastructure and well-located stadium, but I’ll have my own opinions on that matter at some point. But the fact that we just had record frigid cold in the past two weeks cycled with regular snowfalls doesn’t inspire confidence for the future plans. Why do we feel the need to tempt the weather mistress? -I’ll do post-season analysis for teams in the offseason, but the Seahawks have a real chance at building this team for the long haul. It all depends on if Russell Wilson will be willing to give a deep discount to the team that took a shot on him in the third round. Seattle and San Francisco are two teams not handicapped by ridiculous quarterback contracts, and their fully loaded rosters are the prime evidence. Wilson taking eleven or twelve million a year (and not twenty, hi Joe Flacco) means they can re-sign Richard Sherman without decimating their cap situation. They have another year of relative peace, but then key pieces will need to get PAID. -Speaking of those pieces, I would really have given the MVP to the entire Seahawk defense. Malcolm Smith surely had the stats, but both of his “big plays” were really caused by teammates Cliff Avril and Byron Maxwell. And then there was Percy Harvin, who put on a show despite touching the ball like, five times. Oh well. Now Smith has a Chevy truck. And now, your humble host has come to the realization that he won’t see a meaningful football game for at least another six months. But hey… the NFL Scouting Combine is in two and a half weeks. Giggity.